Mencom was founded in 2006. 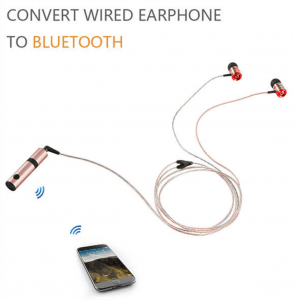 They are a professional manufacturer focusing on Bluetooth products including Bluetooth speakers, receivers and transmitters, headsets, and accessories. 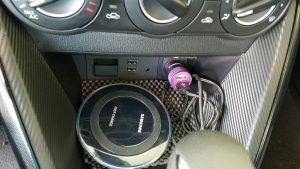 Mencom has a Lipstick AUX-Bluetooth receiver. It looks like a closed lipstick, and it comes in three colors. (The receiver does not work as an actual lipstick.) 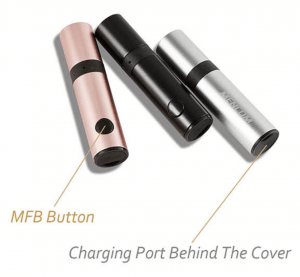 There is a MFB Button on the side of the Lipstick AUX-Bluetooth receiver. The charging port is behind the cover. Todoist wants you to get the most out of Todoist for iOS 11 with a new pair of AirPods. They point out that the headphone jack not likely to return to iPhones anytime soon. 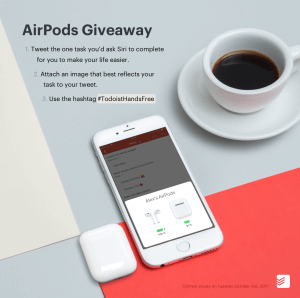 Todoist is giving away a new pair of AirPods so you can enjoy all of the wireless productivity with Todoist and Siri. 1. Tweet the one task you’d like Siri to complete for you to make your life easier. 2. Attach an image that best reflects your task to your tweet. 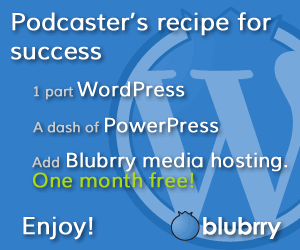 Doing that, and you will automatically be entered to win one of three pairs of Apple AirPods. 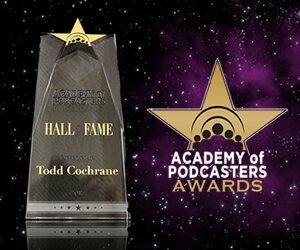 This contest closes on Tuesday, October 3, 2017. 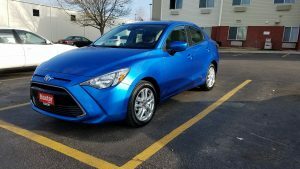 Three different winners will be randomly chosen out of all proper entries and will be announced on Twitter within five business days of the contest closing. With the departure of Hallowe’en, it’s socially acceptable to discuss Christmas in the UK, though I suspect the USA has to get past Thanksgiving before giving in to the seasonal traditions. Recent years have the seen the rising popularity of Christmas jumpers (sweaters) revelling in fun knitted patterns. Jumping on this kitsch clothing are Flavr with a range of festive phone cases, riffing on the jumper styling. Available for iPhones and Galaxy S7s, these Christmas crackers cost GB£18 (inc postage) from Flavr’s Xmas Shop or only £9.99 from Carphone Warehouse stores. 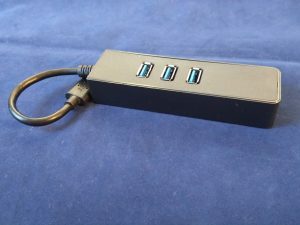 The physical USB type A interface connector seems to have been around forever and to be fair, it’s had an impressive lifespan starting with USB 1.0 back in 1996. 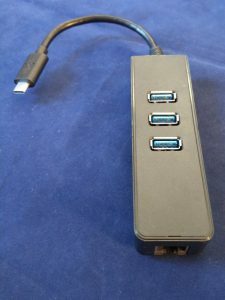 Since then, the communication standard has been updated several times and the connector is still very relevant with USB 3.1 which now sports transfer speeds of up to 10 Gb/s. USB type C is the latest connector design providing high speed data comms in a neat reversible design. So neat that a couple of manufacturers have ultraportables with a single USB C port. 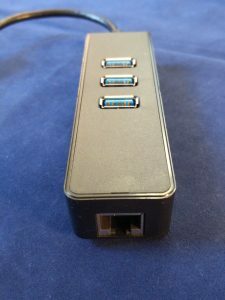 No USB A, no ethernet, no video. Looks great but a pain in the port if there’s a pile of cables to plug in. Accessory makers have stepped in to address the problem and here we have the Topop USB C to three USB A 3.1 ports and RJ45 Gigabit LAN adapter. As the unboxing video shows, the adapter arrives in plain packaging and it’s a fairly functional device: this isn’t brushed metal milled from a single block of aluminium to complement the MacBook. It’s a sturdy matte black plastic . In terms of ports, there are three USB 3.1 type A ports on the top and a Gigabit network port on the far end. A short cable terminates in a USB C plug. 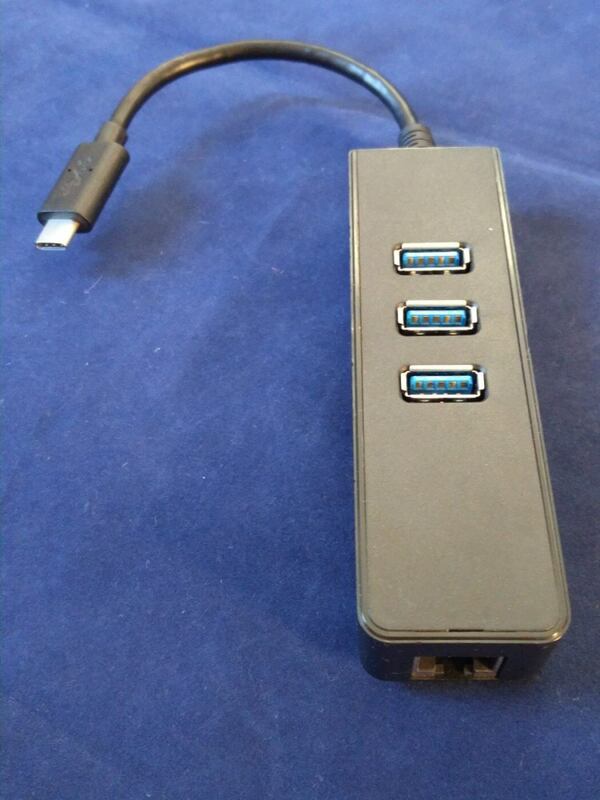 Having three USB A ports and a network port is very useful on these minimalist devices. Who has a USB C memory stick? And there are always wireless dead-spots. The Topop adapter gets out of these predicaments. 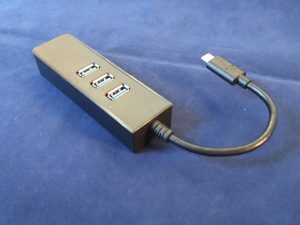 However, I discovered quite quickly that the presence of a USB C socket on a device does not guarantee functionality, so check compatibility on the website and assume that the adapter only works with phones, tablets and laptops mentioned. Believe me, it doesn’t work with the OnePlus 2, 3 or Google Pixel C, but find a device that is compatible (Apple Macbook, Google Pixel Chromebook) and the adapter will work fine. Priced just under GB£20, the adapter’s in the right price bracket for the features that it offers. 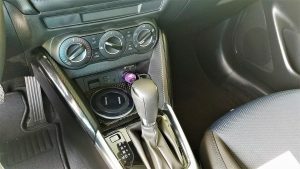 There’s no doubt that the Topop is a handy gadget to throw in a bag for occasional use, though if I was looking for a dock-lite on my desk, I think I would pay more for a better match to my laptop. Of course, your aesthetic requirements may differ. Thanks to GoldenSwing for providing the Topop USB C to USB A 3.1 and Gigabit LAN adapter. Ölens Technology was founded by Ron Meritt and Paul McCloskey III. 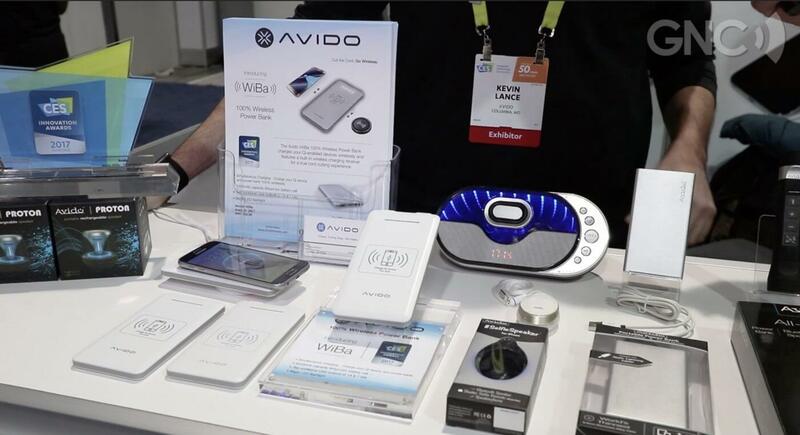 Their mission is to invent products that help people live better lives. They have created LampChamp, a simple tool that will make it much easier for people to charge their devices. There are a lot of people who use a smartphone and who will eventually need to charge it. Trying to keep everything charged can be difficult for families where everyone in the house is using more than one device. LampChamp can turn any lamp into a USB charging station, providing you with another place to charge smartphones and other devices. First, remove the bulb from whatever lamp you want to turn into a charger. Next, screw in LampChamp. The base of LampChamp can screw into any lamp. Replace the bulb by screwing it into LampChamp. You can now plug your device into LampChamp’s 2 AMP USB charging port. There is an on/off switch on LampChamp that controls your lamp. You can use the switch to turn on, or turn off, the lamp. Either way, LampChamp will continue to charge your device. 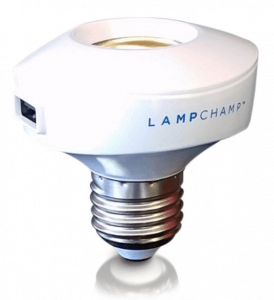 LampChamp works with all cell phones, smartphones, tablets, and e-Readers that require a 2 AMP or less charger. LampChamp might be useful for people who need to do a lot of traveling. It isn’t always easy to figure out where the hotel room’s outlets are located. They might be behind furniture or in inconvenient locations. It might be easier to use LampChamp to convert a hotel room lamp into a charging station.